I recently downloaded The Jerry Garcia Band at The Lunt-Fontanne Theater,New York, NY 10-15-87 from bt.etree.org This was a most magical night for me! I had bought a ticket for this night when they went on sale. I didn’t want to buy for more than one night, not that I could have afforded to anyway, being a college student and just having attended SEVEN other Fall of 87 shows between Two nights in Providence and Five at MSG. But I really didn’t know what to expect from these shows. Jerry was playing Fifteen shows over 13 Days (two Sundays had 2 perfomances, Matinee and Evening) on Broadway. 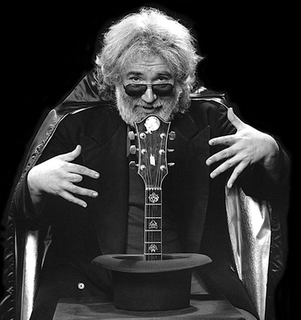 Each show he would play a set with The Jerry Garcia Acoustic Band, a new configuration with old New Riders pal David Nelson on guitar, The Ever Present John Kahn on Stand Up Bass, Sandy Rothman on Mandolin and Dobro, and Dave Kemper, from Jerry’s Electric Band, on Drums . Then he’d play a set with the Electric JGB. Sounded nice for a change. A chance to see Garcia play acoustic. That really hadn’t happened much since the Dead had played Acoustic sets at Radio City Music Hall and The Warfield Theatre in 80′ for their 15 year anniversary. I got shut out of those shows back then, trying to get in Halloween Night with no luck (finally opting to go see Frank Zappa at The Ritz instead, for the third night in a row!). So I went with a bit of anticipation and wonder. It wound up being a pretty amazing scene though. Bill Graham was present out in front of the theatre keeping order, as well as inside; telling people to put out their cigarettes and other burning products and to be careful with their drinks on the carpet. There was also a special surprise for Jerry on this opening night. Graham’s crew handed out plastic Top Hats to everyone in the audience and we were instructed to stand up before the Encore and tip our hats to Jerry in a spoof of the poster for these shows of Jerry in a Cape and levitating a guitar from a Top Hat. I still have that Top Hat by the way. These shows were also marked by Egg Creams, a favorite of Jerry’s, being served in the lobby. Anyway, The Acoustic Band wound up being amazing, to say the least, and the JGB was in rare form Rocking the place with their awesome repertoire of Gospel, Blues, Rockabilly, Reggae, Dead, JGB, and Dylan songs. This recording being evidence of this. Although, as usual with these shows, the audience recordings leave a bit to be desired since they’re all stealth recordings due to the strict no recording policy at these shows. This particular recording sounds okay; the Electric set is much better sounding than the Acoustic. The vocals on the Acoustic set get kind of lost. All in all, worth the download and the listen though. Great energy throughout. As for me personally, I wound up coming back for Six More Shows all together. I couldn’t keep away. The second night, 10/16, I went back with my friend Mike. We didn’t have tickets, but drove down from Bridgeport looking to get in. We’re outside the theatre about an hour before showtime and some lady pokes her head out one of the doors and says “who needs tickets?” We flew over there. She tells us to go across the street for a few minutes and wait for her to signal us back over.Sure enough, a few minutes later she comes back out with a fan full of tickets in her hand and calls us over. We paid price for them and jumped up and down and kissed her “We’re In”. The tickets were in Row G Orchestra (G for Garcia). We later found out she was Eileen Law. I think she was the Stage Manager or Road Manager for these shows. We came back the next night and she hooked us up again, same deal. Wow, what a godsend. What amazing shows. The toughest part was driving back and forth to Connecticut and making it to classes the following days, and scrounging up the money to keep going. I just thank God I went to all those shows. 7 Glorious nights with Jerry and Friends on Broadway. Thanks Bill! For puttin’ on the good stuff! And, can I have another Egg Cream please.